My last summer entry from this Yakutia fieldwork finally brings me to the fieldwork PRACTICE there with the inhabitants of the Lena Delta and coastal area in Yakutia. As some of you may know, one of our crucial methodological approaches in the ORHELIA project is to marry intensive life-history interviewing with anthropological participant observation, which we believe enables us to understand better people’s life histories and ask more qualified follow-up questions. Our programme for the field was to spend half of the time in the village talking to elders about their recollections of the past and their evaluation of the present. The other half we wanted to go out to the summer fishing place and participate in the summer fishing campaign. As we arrived rather unprepared, we didn’t really know what equipment we need for that, and it turned out that there was no place for us in anybody’s tent. So the kolkhoz was kind enough to give us material and instructed us how to build a tent the same way the fishermen do. It turned out that the conditions of the Arctic summer can be incredibly stormy there, and it’s soaking wet on the ground, so you can’t really live in the kind of western expedition tents we are used to. You need a solid construction and beds raised from the ground, a table and plus a stove to heat for cooking. So we spent some mornings and evenings to straighten the poles of an old iron carcass, sanded and painted it new, measured the canvas to be sewn to cover it. The problem with an iron carcass instead of a wooden one is that you can’t fix the canvas to it, so we had to build a wooden frame around the bottom to nail the canvas to it. The construction is so heavy that you don’t need to fix it to the ground – no storm blew it away. The tents of the fishermen have mostly wooden carcasses, and they build them on site from wooden boards prepared in the village and cut to the appropriate length. Most of the fishers tents are neatly furnished, with wooden shelves, wooden floor, some have even carpets on the walls, and big stoves. Some have their own toilet tents and sauna tents next to the main tent, which increases comfort significantly. We had just bare sand on the ground, and used the one public toilet that was there for all the 100 inhabitants of the summer fishing tent-town. 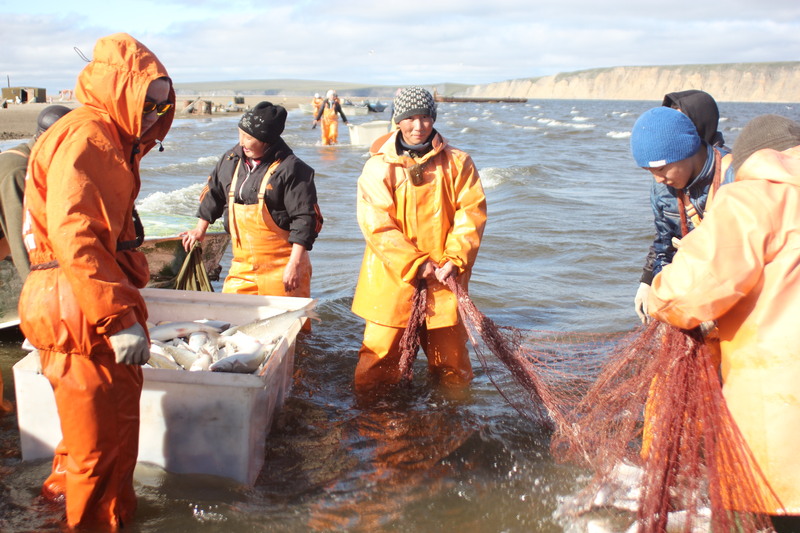 The Lena River Delta is incredibly rich with fish from mainly four different kinds, which come in different seasons and are harvested accordingly: Nel’ma and Osetr are caught immediately after the ice disappears in late May on a particular fishing spot. Then the main season starts around mid-July for Omul’, a little bit later Muksun is mainly caught. A fish called Chir is considered a by-catch In September then the same spots are used for ryapushka fishing. (I update the latin names for these later). The fishing on our spot is organised in three shifts of 8 hours each, round the clock. In July and August it’s light anyway, so you see all day and night long well. In the peak time you can get in one 8 hour shift with a 100 m pulling net (nevod) around five tons of omul. We got 3.3 tons maximum. I’ve never seen so much fish caught in manual work. During fieldwork, Omul was the main fish we got. Delicious!!! The only mechanical tool they use for fishing is a 15 hp outboard engine to pull the net on the river / seaside. On the shore side three or more people pull the net. They then close the circle, “round up” the fish, which ends up in a kind of bag, from where we put it to an iron boat. After each fishing shift a huge fishing freezer ship comes and we bring the fish there. Volodya from the Yakutsk fish factory supervises the weighing, registers the amount, and then the crew puts each fish carefully into a shock-freezer. There the fish gets solid frozen within 30 minutes, and is then put into a normal freezer at -18 degrees. 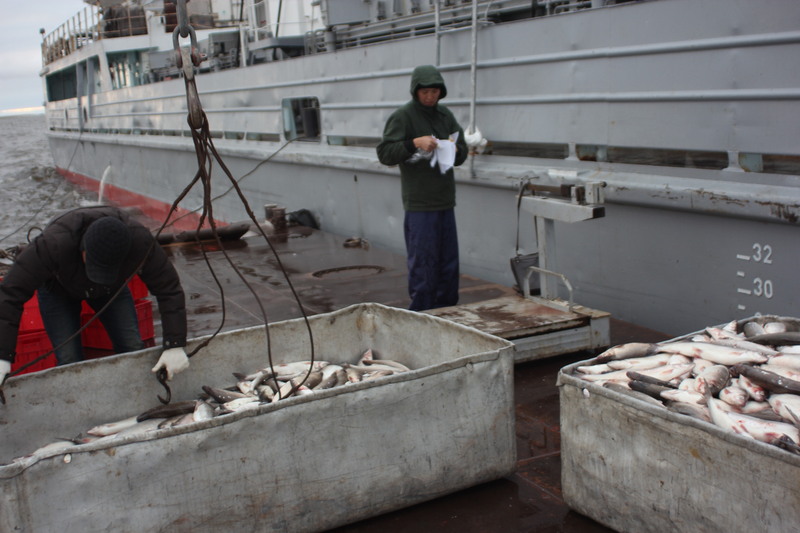 After the summer fishing season, in August, all that frozen fish is brought to the Yakutsk fish factory for processing. Up until the 1950s, all that fishing was done even more manually. People even went barefoot to the River – there were no rubber boots. The nevod was pulled by people rowing, and the fish was frozen in natual ice chambers dug mostly by prisoners during the 1940s and 1950s. In winter the fish would be brought to the processing facilities on dog sledges, up until the 1970s. Then that manual transportation was replaced by Soviet outboard motors and snowmobiles. 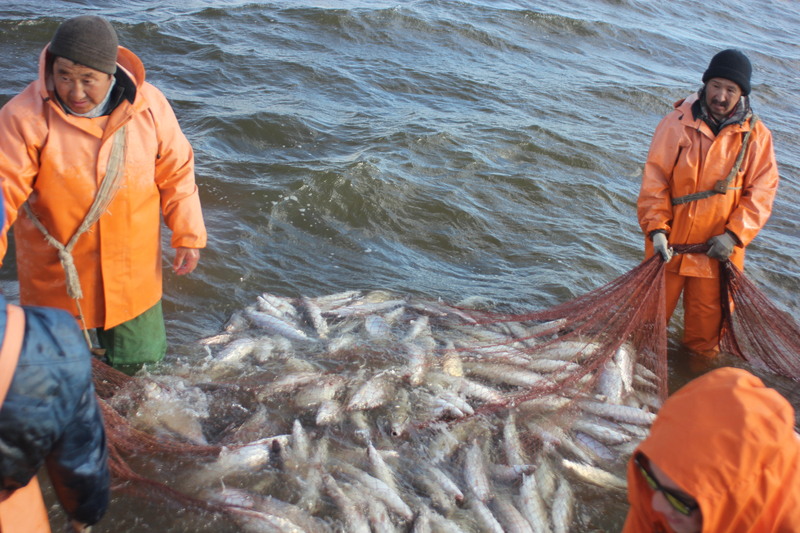 The people who do the summer fishing in the Lena Delta for the kolkhoz “Arktika” are a mix of many youngsters, children and elders, men and women. 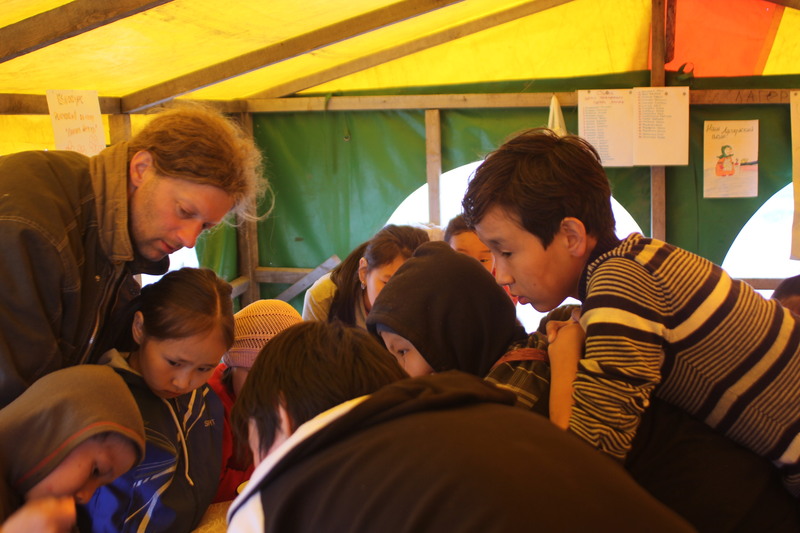 At the time of our stay, they also opened a children camp where the kids help fishing, and at the same time learn how to survive in the tundra, with collecting driftwood, heating stoves, building tents, cooking, etc. I was asked to hold a lecture on the peoples of the North as well, and instead of the envisioned 30 minutes we spent two hours watching photographs from other Arctic areas and answering a lot of questions. While many criticise Putin’s party “United Russia”, their sponsoring of this children’s camp is a really good investment in young people there. 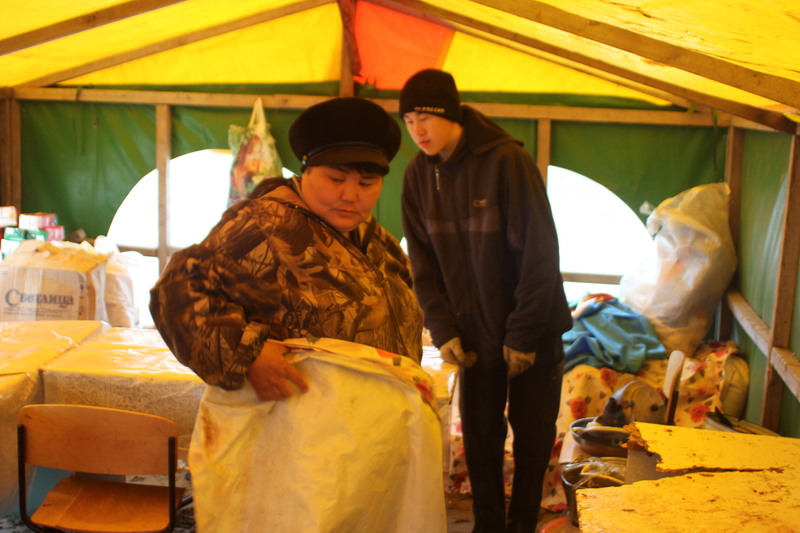 Just as we fieldworkers, they learned how to survive on the banks of the Lena River Delta in any weather from storm, cold, rain and high waives to sunshine and millions of mosquitoes. Quantitatively spoken, for the ORHELIA project we did 21 formal audio and video interviews with elders and mid-aged fishermen and their service staff. Moreover, we talked with numerous younger people and – most importantly – participated in everyday life in Tiksi, Bykov fishing village, and the summer fishing place. Almost all fieldwork partners were happy to have their information included in either printed publications and / or internet materials. I think this marks a first success for the extension of our project to East Siberia. Now the main work will start after everybody’s field season – namely how to put all the information into context and start carving out the main comparative aspects all along the Arctic between northernmost Finland and northernmost Yakutia. This entry was posted in All, Fieldwork, Indigenous Peoples, oral history, Russian North, Theoretical Issues and tagged fishing, Orhelia, Sakha Yakutia. Bookmark the permalink.